You can also check out Jarrett Krosoczka’s Ted Talk about School Lunch Hero Day byclicking here! Showing how much you appreciate a school nutrition employee can be as simple as saying thank you or as special as holding a reception to recognize their achievements. How can you show your favorite school nutrition heroes that you value them? The list below details some different ideas to recognize the efforts of school nutrition professionals. There's something in the list for everyone—principals, teachers, students, parents, supervisors and coworkers. And don't forget, this doesn’t have to be limited to SNEW or School Lunch Hero Day. These can be done anytime of year! Consider rewarding your employees with the gift of SNA membership! For less than 14 cents per day*, your employees can access all of SNA’s member benefits. Visitwww.schoolnutrition.org/join to learn more. Download Activity Sheets and Cards for the students in English and Spanish too! NEW! Check out our printable thank you cards in English and Spanish, featuring new characters. 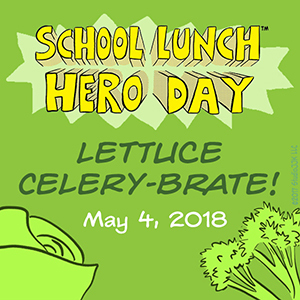 Announce School Nutrition Employee Week (May 7-11, 2018) and School Lunch Hero Day (May 4, 2018) on the signs in front of the schools. Make sure that the week is featured on the schools' calendars and in newsletters. Don't forget to include the celebration on your menus for the week. Recognize your employees' achievements during morning announcements or even during a special segment on the school's TV show. Make signs, banners or posters to decorate your cafeteria and to promote the work your staff does. Feature photos of the employees and a short description of why they are special. You could also add something to your school or district Facebook page. Send a thoughtful greeting to make your employee feel special. Reward staff with gifts from the SNA Emporium. To browse School Lunch Hero Day merchandise, click here. Promote School Lunch Hero Day on your social media channels like Facebook, Twitter and Instagram. SNA has some sample art available to download and share. Purchase School Lunch Hero Day merchandise for each staff member from SNA's Emporium. Arrange for the principal and teachers to serve the food for one day, while your staff is treated to a “sit-down” lunch with the student government members serving them. Let an employee be the boss for the day. On a day that's not so busy (yes, we know they're hard to find) switch places with your staff member. Let him or her experience what it's like at the top and see how important each person on staff is when it comes to getting the job done. Establish a presence in the front office. Make sure school visitors see how talented your staff is by posting information such as a framed appreciation proclamation in the front office. Introduce your staff during the lunch period and prepare the students ahead of time to give them a standing ovation and a huge round of applause. Arrange with your principal to have the teachers and their classes write notes of appreciation to your staff. Post them in the cafeteria for the customers to read. These are just a few ideas to recognize the achievements of the school nutrition employees who make your days brighter. Do you have ideas you would like to share? E-mail content@schoolnutrition.org and your suggestions may appear on the SchoolNutrition.org list.